After a test run in the UK, Legal 500 has asked law firms in Asia to use its new online system for the next round of submissions – with EMEA (Europe, Middle East, Africa) and the US to follow later in 2018. The international rollout follows the launch of the new online submission system in January 2018. Whereas law firms previously attached a Word document to an email and sent that to Legal 500, now they are required to use an online database. Shortly after the launch a beta testing group (mainly managers that oversee the legal directories at UK law firms) was asked to trial run the database and feedback any issues to the Legal 500 development team. Now some of the initial glitches have been ironed out, the system is in the process of being extended worldwide. The context to the online submission system is that Legal 500 is moving to a wholly digital platform that will feature a new, enhanced website, and improved online functionality. This will mean that the famous hard copy directories, which have graced law firm offices and libraries for 30 years, will be phased out in 2018, starting with the EMEA directory in April 2018, and subsequent guidebooks thereafter. Legal 500, which says that 99% of the readership of its directories is online, has been moving in this direction for a while; some of their directories over the last year featured extended editorial commentary in the online-only version as a way of moving beyond the traditional space constraints of the printed product. A key element of this new digital platform is that Legal 500 will look to introduce advanced search functionality – tailored to in-house buyers of legal services – with users able to select and identify law firms by industry sector and other variables. Law firms will be able to pull up the last 10 years of rankings and compare different firms. You log in by entering your username and password. Based on a modified version of WordPress, the functionality will be familiar to anyone who has used a content management system for a blog or website. Legal 500 has designed the system so that all archive submissions will be stored under a firm’s log-in – a neat feature, given the staff turnover within law firms – and you can see what has been submitted and what hasn’t. If you choose to work straight off the online system, you input information directly into the system, essentially building up the submission by typing directly into the online form. Within the system, you hit “save draft” to save your progress, and you can return to complete the form at a later date, should you wish. An alternative option, which in all likelihood will be the preferred route for most firms – at least in the early stage – is to use a paper form. Under the log-in screen, you can find a link with a paper form that mirrors the input fields on the database, and with one click will upload it directly into the online form. Using this approach, you would prepare a draft entry in Word/paper form, and then circulate it around the various people internally for review/comments. Once the submission has been signed off – in the usual fashion – it can then be uploaded online using an “import from MS Word” button. 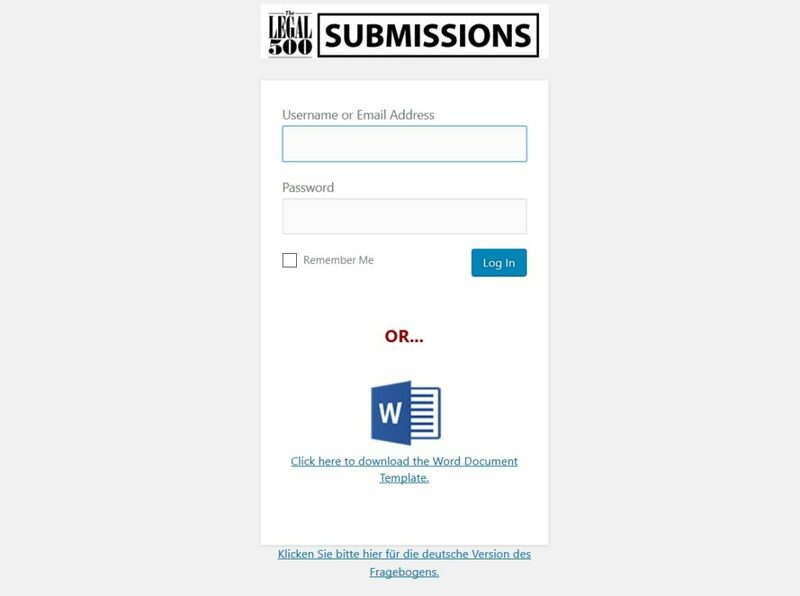 Legal 500 says there is no advantage or disadvantage to using either of these approaches to filing the submission – as the content all ends up in the same place. Anyone who has worked on directory submissions will not find any radical changes to the type of information requested by Legal 500. The online firm largely reflects the information required by Legal 500 as per its existing guidelines. The main change is that an online form is by its nature more regimented, with the more freewheeling submissions of the early days of the directories destined to be a thing of the past – although there are some free text areas for the old timers. Two dropdown menus to identify the section to which you are submitting – one for the relevant regional edition of the Legal 500, and another for the specific country/practice. Enter your own label to identify your submissions, for example – “Directory/Firm/Country/Practice”. Firms that do multiple submissions would be wise to settle on a standardized naming convention for ease of access. As is the case now you have space to enter in the name of the person that is coordinating the submission – usually someone in the marketing function. Legal 500 will usually contact this person in the first instance to arrange partner interviews and if they have any queries. This is a free text area, and provides space for law firms to summarize the practice, and draw out its strengths, features and characteristics. Like the overview section, this is a free text area. Here is your opportunity to comment on the treatment of your law firm in the Legal 500 rankings, and the relative placing of other law firms. This will be familiar to those that use the Chambers form, as it offers the chance to list out the internal name of your practice, which is sometimes different from the equivalent category in the directory. Here you add in the name, title, email address and phone number of the lawyer that leads the practice. For groups with multiple heads, there’s an option to add an extra line. Two boxes where you enter the numbers of partners and non-partner lawyers in your firm that specialize in this area. This section covers both those lawyers already ranked and those in your firm that you wish to see ranked. For each, you click “Add Lawyer”, enter his or her name, job title, email, and telephone number. Below the contact details you add in a written description of their practice. There’s no limit to the number of names you can include, which I think is right, because practices vary considerably in size, although Legal 500 sensibly cautions firms against providing too many names. As ever, firms will have to be realistic and not include too many names. Legal 500 has been pushing younger lawyers in the last couple of years and the online form has space to highlight your rising stars. The format is the same as adding in regular lawyers, but is reserved for younger partners and associates. In this section you can identify any lawyers that have joined or left the firm, and any internal promotions. The form allows users to add client names, marking each as “publishable” or “confidential”. You can add the names of companies that have admitted your firm to their panels of preferred advisors. Up to 20 matters are now permitted – an increase on the previous 10. Firstly, you enter the name of the client, then whether the client name is confidential. You can also specify the client’s industry sector. Then there is a free text area to describe the matter and draw out any interesting aspects. To mark any parts confidential, you use a special button which colors the text red. To specify the value of the deal or case, use the dropdowns to insert the currency and value. Highlight if the matter is cross border by entering the name of the jurisdictions involved. The you credit the appropriate lawyers that worked on the matter, and add in dates as to when the matter started. What about the client references? The process remains much the same: you compile your selection using the existing Excel spreadsheet, and this is uploaded to the online system alongside your written submission. How strict is the new system as regards accepting late submissions? With the best will in the world, we know that directory submissions are sometimes late. There are often instances when you want to update an entry post-submission because a partner has left, you want to mark something confidential that was originally publishable, or you’ve won a massive case or landed a top partner from another firm. Legal 500 has said that the system will be flexible enough to accept changes once the official deadline has passed, but has not decided how long that period will be. Unlike Chambers, Legal 500 usually begins its research reasonably quickly after the deadline (with some variation between researchers), so the “window” within which changes can be made will be open, but not for too long. They also naturally do not want to encourage “elastic” deadlines. Once the research gets underway, it is likely that the system will stop accepting changes, and anything crucial that happens after that stage will have to be relayed manually to the researcher for that section. The key point here is that despite the fluid nature of the new system, Legal 500 is not moving to a year-round rolling system, where you can update your submission at any time. The submission process is still tied to the annual research cycle. Does this new system apply to all firms? The only exception is the UK Bar. Barristers in the UK have always had a separate directory to solicitors, and their submission format is slightly different. Barristers will continue to use the old system – for the time being. Everyone else – solicitor firms in the UK plus law firms in all other countries around the world – will be encouraged to move to the online system this year. Some firms may decide to stick with the old way of emailing their own submissions. I suspect Legal 500 will be flexible about this in the short term, recognizing that firms have developed their own infrastructure, and change does not happen straight away. The official line, however, is that every firm is encouraged to use the new system, and that only the new format will be accepted. Change is inevitable, and it was only a matter of time before Legal 500 sought to streamline its process and have firms drop information directly into its systems. Data is the new oil as they say and it’s sensible for Legal 500 to move to a system where the vast reams of information it receives from law firms can be analyzed more effectively than having to manually scan thousands of paper documents. While the benefits for Legal 500 are obvious, the extent to which the new approach will be welcomed by law firms will depend on the efficiency of the new system and whether it takes firms any longer to prepare submissions than it did previously. That said, a touch more simplification would help. The prescriptive nature of the form means there’s now lots of fields, boxes and dropdowns, and while many of them are optional, their presence nevertheless will lead some firms to believe that they need to be completed or face being penalized. The matter highlight section in particular is over complicated. I would also hope that if Legal 500 is demanding more information from law firms then we could expect to see expanded editorial coverage in return. A bugbear of law firms is that when directories are published the rather paltry editorial commentary doesn’t always do justice to the rich seam of material that the directory has as its disposal. There will undoubtedly be niggles here and there, but I’d encourage firms to dive in and start using the new form. Legal 500 has always been regarded as a user friendly organization and I’m sure they’d be receptive to any constructive feedback. Hopefully what emerges over the next year will be a modern system that strikes a balance between the needs of the directory publisher and the law firms – and will serve the market well. Share the post "Legal 500 Rolls Out Online Submission System"
we have used them over the years and were very pleased with the results. As far as potential clients purchasing the new online directories, will there be an online fee , how will we access the directories? Thanks look forward to fining out how we will be able to use the directories in the new online mode.